Publisher: Simon & Schuster, 2012, 398 pp. In this vivid, insightful history of the bitter controversy that led to the Compromise of 1850, journalist Bordewich (Washington: The Making of the American Capital) reminds us that Southerners dominated all branches of the federal government until 1850. Every president had owned slaves except the two Adamses, and Southern states still made up half of the Senate. The territorial bonanza after the 1845-1847 Mexican war threatened their control because California and New Mexico's governments excluded slavery. Outraged Southern leaders refused to accept this, paralyzing Congress for months. 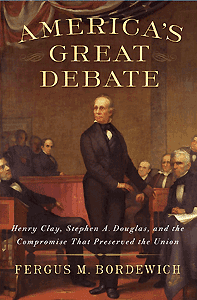 A compromise designed by an aged Henry Clay failed, but was quickly revived and passed thanks largely to Stephen Douglas. It admitted California as a free state, put off the status of the remaining territory, and strengthened the fugitive slave law. Despite narrow passage and wildly abusive debate, it was a dazzling achievement that temporarily staved off civil war. Political history is often a hard slog, but not in Bordewich's gripping, vigorous account featuring a large cast of unforgettable characters with fierce beliefs.